Happy Easter everyone - here's hoping that the Easter Bunny came hippity hopping your way this morning and was generous with the jelly beans and hard boiled eggs. "Rabbit" Maranville is one Hall of Famer player who liked to "hop" from team to team. In a time before free agency, Maranville played for 5 teams in his 15 year career - more than your average bear... errr.. rabbit in that era. In the midst of all that jumping, he spent 75 games with the Cubs in 1925. 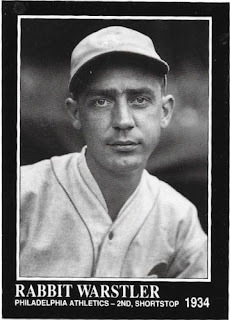 During the brief stint, Rabbit was even named the player/manager of the team partially through the year. However, his infamously, goofish and immature behavior (throwing the contents of a spittoon at his players, running wildly through train cars so that his men couldn't sleep) quickly showed that he wasn't suited for a leadership role and he was quickly shown the door. At least he wasn't "egging" the opposing teams' hotels? The second "Rabbit" who came bouncing into the Northside of Chicago was one Harold Warstler, a middle infielder who played the final games of his Big League career with the team in 1940. Having spent most of his career as a solid, but unspectacular up-the-middle presence for Boston in the NL and AL, Warstler was selected off waivers from the then Boston Bees (Braves) in late July and was released just before the start of the 1941 season. All told, he played 45 games for the Cubs and batted .226 along the way, proving that he'd reached the end of the road. You might say that no-bunny wanted him after that performance. And on that note, I'm outta here - I hope you enjoyed this terrible grouping of puns with a loose Easter theme. I've got family celebrations to ruin with even more awful jokes.